The fragments consist of two leaves that are made of animal skin, 33.3 cm by 24.5 cm in dimension. The verses of the Qur’an are written in clear Hijazi script. The text has skeletal dots that differentiate consonants. Skeletal dots were used well before the time of the Qur’an, as they are found in a number of ancient Arabic writings that predate Islam. The text of the two folios does not have diacritical marks for the short vowels. These marks are believed to have been introduced by Abū al-Aswad al-Du’alī (d. 69 H / 688 CE), a grammarian and close companion of the fourth caliph Imam ʿAlī bin Abī Ṭālib (40 H / 661 CE). The folios are double-sided, making up four pages in total. They were almost certainly part of a complete muṣḥaf. The front page of the first leaf covers verses 17-22 from Chapter 18, “al-Kahf.” The back page of this leaf continues from verse 23 to verse 31. The second leaf is from a later part of the Qur’an. The first half of the front page contains verses 91-98 of Chapter 19, “Mariam,” which are the last verses of the chapter. The second half contains the first 12 verses of Chapter 20, Ṭāhā. The back page contains verses 13-39. 1) These two leaves were probably written just after the Prophet Muhammad (ṣallā Allah ‘alaihi wa ṣallām) died. The Prophet was born in 570 CE and received the first revelation of the Qur’an when he was 40 years old, i.e. around 610 CE. All verses of the Qur’an were written down as soon as they were revealed. So the Qur’an had all been written down by the time the Prophet (ṣallā Allah ‘alaihi wa ṣallām) departed this world in 632 CE. Most scholars believe that the Qur’an was first compiled in one volume during the caliphate of Abu Bakr (d. 13 H / 634 CE). This process was then formalized during the rule of ‘Uthmān bin ʿAffān (d. 35 H / 656 CE), around the year 29 H / 650 CE. Personally, however, I think the muṣḥaf was compiled during the life of the Prophet Muhammad (ṣallā Allah ‘alaihi wa ṣallām), but this is not the subject of this article. Radiocarbon dating has dated the parchment to the period 568-645 CE with 95.4% accuracy. The writing on the parchment is likely to have been made immediately or shortly after the death of the animal it was taken from. One has to talk about a combination of range and accuracy level when using this technique, but the range suggests that the muṣḥaf to which the two leaves belong was probably written shortly after the departure of the Prophet (ṣallā Allah ‘alaihi wa ṣallām) or maybe even late in his life. 2) An equally significant fact is that the text on the two leaves is identical to the text of the muṣḥaf we have today. The text of each verse in the muṣḥaf that Muslims have today and the manuscript match word for word. Even the order of the verses in both is exactly the same. Furthermore, the front page of the second folio shows that the order of the chapters is also the same, with the Chapter of Ṭāhā following that of Mariam. In other words, the manuscript confirms that the Qur’anic text has been perfectly preserved and has reached us without being changed. To illustrate this extremely impressive fact as clearly as possible, I have asked my younger brother Faiz, who is very skilled in using graphics editing software, to attach to the image of each page of the manuscript the corresponding text of the Qur’an from the muṣḥaf in circulation. 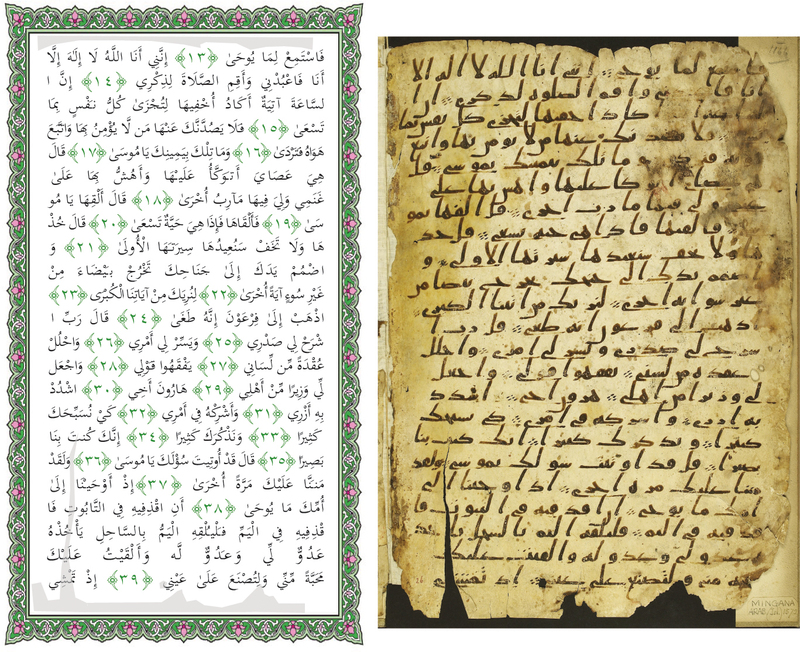 The text of the muṣḥaf has been split on each line to match how it appears in the manuscript. The parts of the text that are illegible because of damage to the manuscript have been shaded in the created image of the muṣḥaf. 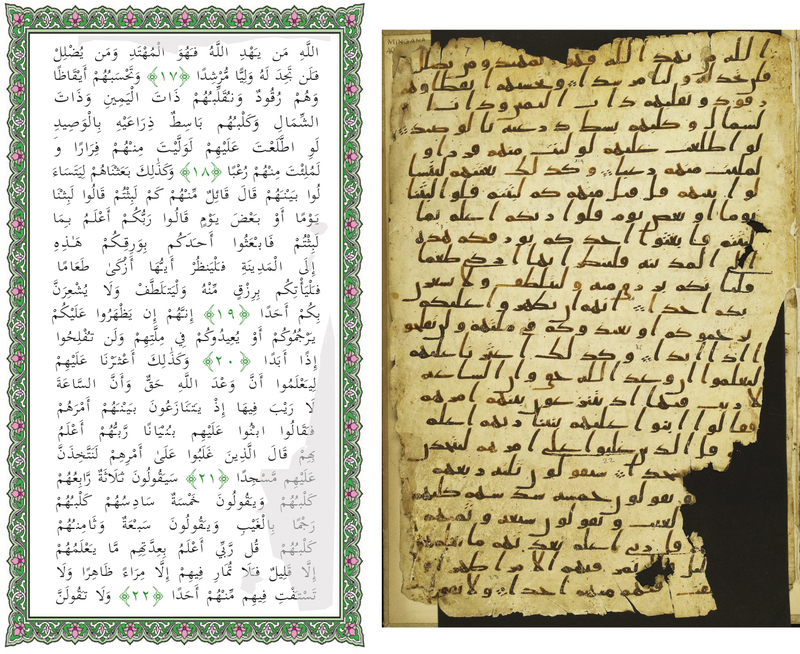 The four images clearly show how the text of the muṣḥaf today matches the early manuscript exactly. 3) Another point worth making is that the end of each verse has been marked on the manuscript with a group of dots. Again, the manuscript and today’s muṣḥaf agree on when each verse starts and ends. But the discovery of the Birmingham muṣḥaf has also revealed uncompromising and almost irrational objection to the concept of the preservation of the Qur’an. 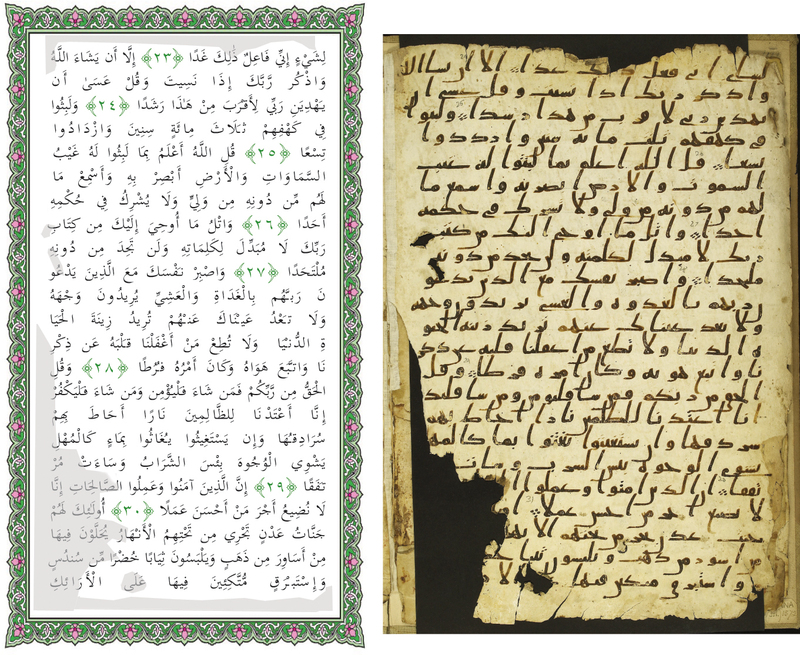 Some have tried to turn the significance of this stunning discovery on its head, claiming that it questions rather than supports the preservation of the Qur’anic text! The piece of information that has been used to serve this purpose is the date range that the radiocarbon examination has assigned to the parchment. As the earlier part of this range goes back even before the birth of the Prophet Muhammad (ṣallā Allah ‘alaihi wa ṣallām), it has been suggested that the Birmingham muṣḥaf may predate its Prophet! In other words, the claim is that the Prophet (ṣallā Allah ‘alaihi wa ṣallām) simply copied and used texts that were already in circulation. All of the instances in which this claim was made that I have come across carefully fail to mention a critical fact. 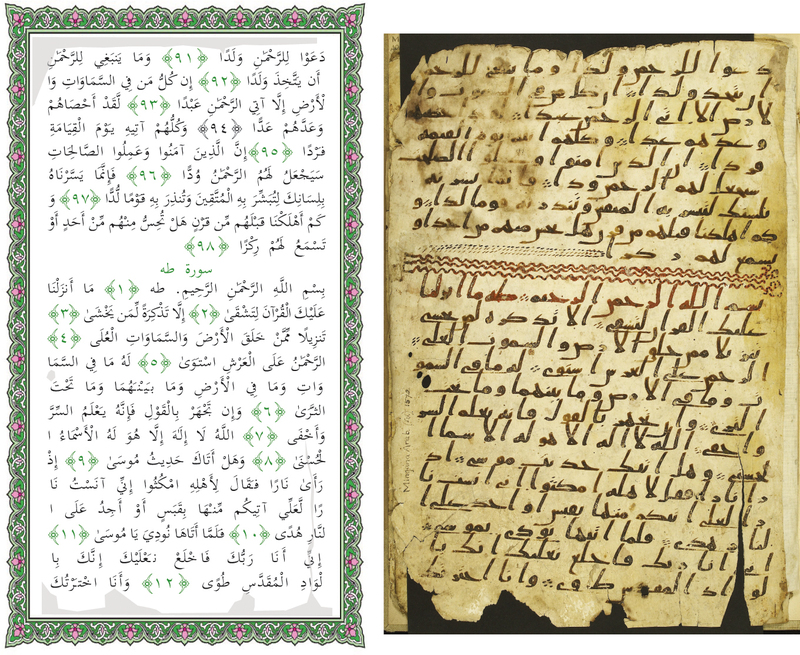 The Qur’an was revealed over 20 years or so, yet the range suggested by the radiocarbon dating for around 95% accuracy is as wide as 78 years, because of limitations of the technique and the nature of parchment. This means that it is mathematically impossible for any text from the time of the Prophet or shortly after him to avoid the suggestion that it existed before him. Even if the radiocarbon dating range, whether for this or another manuscript, was narrower, it would still be more than 20 years, and those who would like to advance this claim would continue to do so. This claim is made in a clearly misleading way. Those claimants express their view in a way that suggests that the claim is the “result” of the newly found manuscript. This is completely untrue and misleading. This claim can be made regardless of the details and facts of any manuscript, because radiocarbon dating would probably always yield a date range that is bigger than the 20 years over which the revelation of the Qur’an took place. In other words, the Birmingham muṣḥaf is being presented as the reason for a claim that actually has nothing to do with that manuscript. This claim is nothing other than a belief that is held independently of the Birmingham muṣḥaf, which this manuscript does not support in any way. While the discovery of the Birmingham muṣḥaf has been misrepresented as potentially indicating that the Qur’anic text had existed even before the Prophet (ṣallā Allah ‘alaihi wa ṣallām) was born, the more popular, though no less absurd, claim against the preservation of the Qur’an has so far been that it continued to be developed many decades after the Prophet died! This bizarre claim has been embraced only by a minority of scholars, not least because there is not a shred of evidence to support it and there is plenty of evidence, including old manuscripts, that refutes it. So this older, baseless claim has now been joined by the exact opposite claim that the Qur’an existed before the Prophet Muhammad (ṣallā Allah ‘alaihi wa ṣallām) was born! They both share the same objective, however, of discrediting the Qur’an and the Prophet Muhammad. thanks a lot for this, louay ji! No need to give much time to this MUSAF, we know that the QURAN is from ALLAH and we have it in the true form as he wanted and under his protection. Are you not pleased that such an early manuscript of the Qur’an has been discovered here in the UK? I most certainly am.It is a great privilege to have such awonderful treasure in a British institution. It is amazing to point out that the same people who claimed that the quran evolved after prophet muhammad now claim that it predates him. They’ve made their mind up.